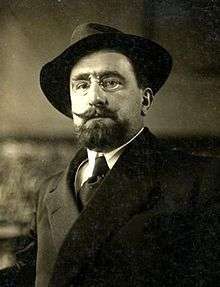 Alceste De Ambris (15 September 1874 – 9 December 1934), was an Italian syndicalist, the brother of Amilcare De Ambris. De Ambris had a major part to play in the agrarian strike actions of 1908. De Ambris was born in Licciana Nardi, province of Massa-Carrara. He engineered the split within the Milanese Syndical Union (USM) through his August 18, 1914 public speech, when he took the side of interventionism and advocated Italy's entry into World War I. As a partisan of national syndicalism, he believed the war to represent an opportunity equal to the impact of the French Revolution, and took his supporters (USM and Parma Labor Chamber) out of the Unione Sindacale Italiana to found the Fasci d'Azione rivoluzionaria internazionalista. The manifesto of the new movement attracted Benito Mussolini, who led his own movement, the Fasci autonomi d'azione rivoluzionaria, into a merger that gave birth to Fasci autonomi d'azione rivoluzionaria. With Gabriele D'Annunzio, he coauthored the Charter of Carnaro, a constitution for Fiume. De Ambris provided the legal and political framework for the document while D'Annunzio used his skills as a poet to make the document more impressive; he was also the leader of a nationalist syndicalist union "Unione Italiana del Lavoro." "a filthy pawn in Mister Giolitti's game of chess, and made out of the least dignified section of the bourgeoisie"
His citizenship was withdrawn in 1926, and he had to flee for France. He continued attacking the regime through his writings (published as Lettere dall'esilio - "Letters from exile"). He died at Brive, France, in 1934. Wikimedia Commons has media related to Alceste De Ambris.